Some men just want to watch the world burn. Some want to literally watch it burn, and explode, and even see its inhabitants dismembered in a gruesome, pixelated fashion. That’s where Butcher comes in. Butcher, now released on the Nintendo Switch, is a pixelated platform-shooter with the gore and violence reminiscent of games such as DOOM. In Butcher you play as, who else, the Butcher ,whose goal is to exterminate “human vermin” from the planet. You start off at the gate, the hub world of the game, where you have one level to choose from at the start. When you enter the world, you’re equipped with just your shotgun and chainsaw, the former having a limited number have ammo and your chainsaw being the last-resort melee weapon. However, as you progress through the game you will obtain additional weapons such as an assault rifle, flamethrower, and even a grenade launcher. When you have a gun equipped, you aim with the right stuck and move with the left, jumping and shooting with ZL and ZR respectively. Flamethrowers make the world very dangerous to traverse. Being able to aim while running is where this game shines. As you’re progressing through the levels, the other pixelated humans will shoot at you. This is where you multitask your best platform maneuvering while aiming with the weapon of your choice and hitting your prey where it hurts: their entire body. Killing the humans is oddly satisfying, though it’s not for the squeamish. When you kill someone, often times their body is split apart, leaving what I assume to be a trail of organs connecting the pieces. If the visuals aren’t grotesque enough, each dying person lets out a disturbing, often realistic scream. This feels less like a fight and more like a slaughter. The walls are painted with blood! That doesn’t mean they’re unarmed. If they aren’t running away from you, they most likely have a weapon you’re able to wield as well, leading to some dangerous enemies such as a flamethrowing wielding jetpack maniac (no, you can’t get a jetpack) or a giant robot grenade launching juggernaut. Unfortunately, these enemies feel limited. Over time you encounter more, but the variety doesn’t reach the large volume you’d hope for in a game where you’re taking out an entire planet. The lack of variety is where Butcher falls apart. There are five worlds comprised of four levels each and a single boss at the end of the game. Each of these levels are in supposed to be in different areas such as Ironworks Facility and the Jungle Outpost, but they don’t feel very different when you’re playing through them. 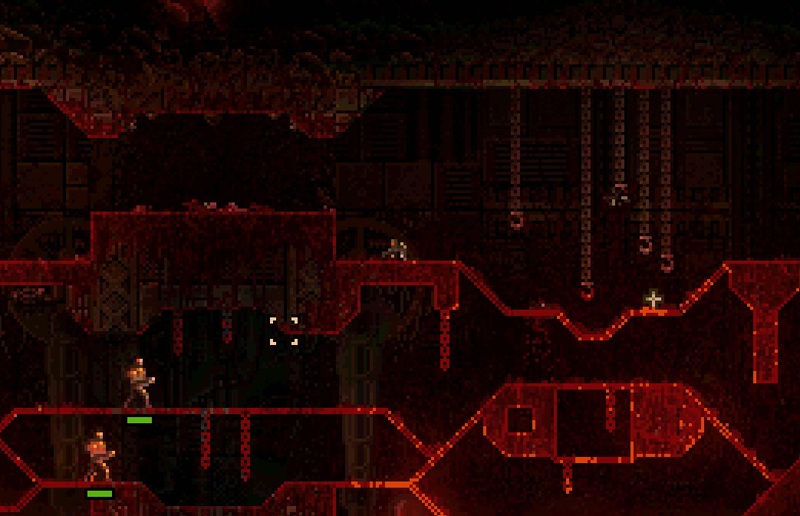 There are slightly different quirks in them like giant buzzsaws that you have to run away from or piranha infested waters, but beyond that, each level looks very similar. That thing is as terrifying as it is deadly. How you go through the levels is almost always the same as well. There are enemies you kill, sometimes you hit a switch, sometimes you’re stopped by a wave of enemies, and then you hit the end of the level. The only difference between later levels and earlier ones are slightly different hazards, different weapons and slightly tougher enemies. Butcher is also an incredibly short game. With five worlds and four levels in each world, there are only 20 levels and one boss in total, meaning you can easily complete the game in around an hour the first time you play it unless you play on the higher difficulties. The easiest mode isn’t Hard, but it’s definitely the standard. One of the things advertised in the game’s trailer is that it’s brutally hard, but if anything its difficulty is just trial and error while you figure out where the enemies will come from and how the stage will react. There are different difficulties such as Hard, Harder, The Hardest, and an unlockable Impossible difficulty. The difference between difficulties isn’t significant, it’s just less health and a smaller amount of pickups, or in the case of Impossible, none at all. Playing on a higher difficult just forces you to be more cautious with how many hits you take rather than changing up the hazards you face. There is something easier than Hard: Casual. On Casual difficulty, your health and shield can be twice the normal amount with special secret bananas hidden around to restore more help in place of skulls. In an attempt to add a layer of replayability to the game, each level contains between one and three skulls to collect. These skulls are often in hidden areas such as a hidden passage through a wall or behind a wall that closes if you don’t get to it fast enough. These skulls should be fun to get, but they feel more like a chore as they’re hidden in some of the oddest places and don’t feel entirely satisfying to obtain. Another issue is the control scheme. Jumping and shooting with ZL and ZR is fine, but I wish there was the ability to map the controls to different setups. L and R are only used together as a suicide button if you get stuck (like I did while playing Casual in The Last City and survived an impossible-to-survive fall), but I wish I had the ability to change my weapons with L and R instead of Y and X. Being able to change weapons quickly is integral to being able to survive difficult firefights and use your arsenal to its fullest potential. Lastly, this game should lead to an enjoyable boss fight, but the only one this game offered was a massive disappointment. Instead of being a large boss that takes you all of your skills to beat, you have a boss that is tracked to follow you, leaving it to become a game of running away as quickly as you can, spamming the fire button without a need to aim. At the end of the day, Butcher feels good to play, but it doesn’t have a lot to offer. If there were a few more bosses or levels, this could have become something incredibly. Instead, we’re left with something that feels incomplete that leads to a mostly unsatisfying experience in the end. Butcher is a grotesque love-letter to older shooters with addictive gameplay, plenty of different difficulty settings and disturbing imagery. However, it doesn’t have enough to offer as the content falls short leading to an incredibly unsatisfying conclusion.